Muslim women love to try new outfits and owning an outfit that is in vogue is the dream of every woman. One such outfit that is in fashion is an Islamic tunic. These tunics are ideal for every Muslim woman as they look stylish and at the same time abide by the rules of Islam. Tunics can be teamed with a pair of trousers, jeans, skirts or even leggings. A wide range of tunics are available in the market and you can select one according to your requirement. The simple tunics are ideal for daily basis and the fashionable ones can be worn during occasions. Let us have a look at some of the styles available in Islamic tunics for women. -Various length of sleeves: Tunics having various sleeve lengths are available in the market. The length of the sleeves might range from short, three-quarter, capped to long. The overall look of a tunic majorly depends on the type of sleeves. 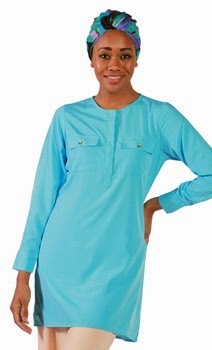 A tunic with full sleeves is ideal for a Muslim woman as they must keep their arms covered. If you are willing to try out a tunic with short or three-quarter sleeves, you can wear a thin full sleeve top under the tunic and give it a new look. This will make you look stylish and at the same time modest too. Islamic tunics looks lovely when paired with loose Islamic pants. I had a good collection of both tunics and the pants. Most of them are bought from eastessence itself. Love your collection. And Nice article. This is so much more than I needed! But will all come in use thanks!